As the Occupy movement matures, it will need to clarify its overall objectives and develop a grand strategy for achieving them. It will perhaps find guidance in the work of Dr. Gene Sharp. Gene Sharp is widely regard as “the world’s foremost expert on non-violent revolution,” but few people have ever heard of him. His book, From Dictatorship to Democracy: A Conceptual Framework for Liberation (1993), has reportedly been translated into more than 30 languages, and can be freely downloaded from the web. He has recently been written up by Thom Hartman (Gene Sharp’s Peaceful Revolution Techniques) and the BBC (Gene Sharp: Author of the nonviolent revolution rulebook). This entry was posted in Emerging paradigm, Occupy Movement, Politics and tagged Gene Sharp, nonviolence, nonviolent struggle, The Occupy movement. Bookmark the permalink. 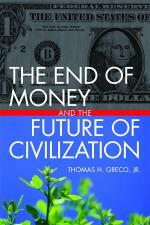 The End of Money certainly contains some information that is relevant to these points. Gene Sharp also makes the questionable suggestion that “Destruction of own property” is a “Symbolic public act”. Hopefully a revolution doesn’t just take us right back to where we started. If everyone could magically create an actual Fed Res $100 bill and spent it, it wouldn’t be counterfeit if they promised to earn back a $100 bill and tear it up before the retire. Expand the cash supply enough to bring the economy back. Of course, the bank would go out of business. There are revolutions all the time, and the bankers always win.